If you are new to budgeting, it can be a tough thing to get the hang of. At least it was for us. First of all, it’s tough to lay everything out to begin with. When you’re used to just letting money spend itself it can be tricky trying to tell it where to go. Then there are those weeks or months where you feel like the entire budget blows up in your face and you are left scrambling to figure out what went wrong. Don’t worry, I’m here to tell you you’re not alone and give you a game plan on what to do if this has happened to you. 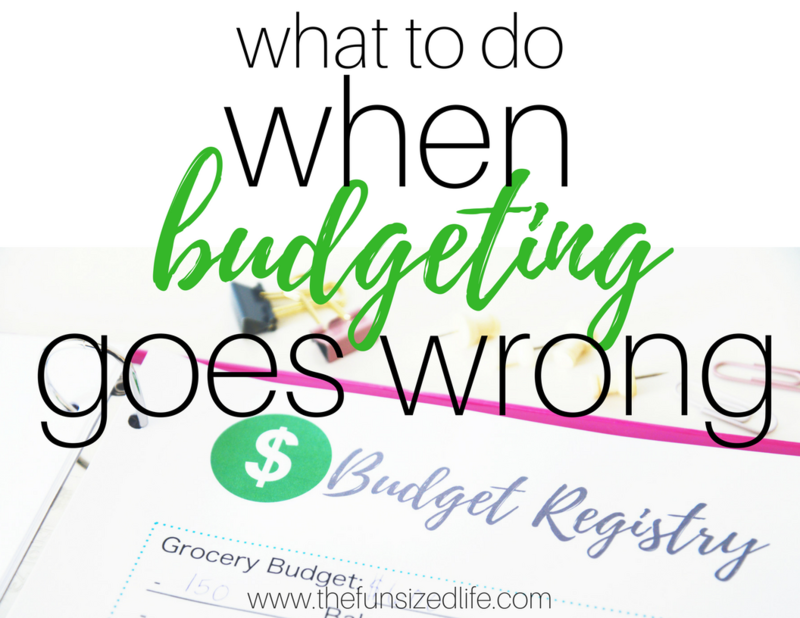 So let’s talk what to do when budgeting goes wrong. Before you panic, get your budget, open up your bank statements, and sit down with both of them. Look over your purchases and tally up what you spent and where. Where did you spend more? Were there parts of your budget that you went over on? Maybe you bought more groceries than you anticipated or pushed your entertainment budget a bit? Perhaps you decided that sale was just too good to pass up and totally blew through your clothing fund. I’ve been there….about 800 times. Whatever the case, it’s important to get clear on what went wrong. It can be very eye opening to realize where you are wasting money. When you start going through and comparing your budget to your actual spending, try out my Fun Sized Budget Bundle. There is a budget sheet to get you started and a sheet to help you compare when things go wrong. I highly suggest writing it out. Get those numbers on paper. When you add up those costs it can be a major rude awakening that gives you the motivation to make it stop. Did you forget a bill? Was there something you just totally forgot to add into your budget? I do this all the time. Even after years of practice. I just did it this month. I opened our account and saw a bill that I totally spaced…a pretty big one. Keep calm, just write it down on your budget so you don’t forget next time. Did an emergency pop up and you just spent the money without thinking? Flat tire, vet bill. Emergencies come up all the time and there is nothing we can do but take deep breaths and try not to panic. This is why trying to get together a $1,000 savings fund or more is crucial to your checkbook and your sanity. –Side note…people probably don’t have check books anymore. I should probably get with the times and get new metaphors. If you have a spouse and are looking over this budget, be sure to make them a part of it. I know it isn’t always easy, but the best thing about 2 heads is that you have 2! A lot of times one of you might be able to see something that the other cannot. Plus, it’s so important to be open and honest about your finances with one another. Start brainstorming some ideas based off of where your budget went wrong. What can you try differently the next time around besides just giving up. That never works. This is something Tom and I have noticed works huge for us. We tend to always over-spend on our grocery budget when we aren’t using cash. We are both very hands-on people. Plus, people in general are more likely to spend less when using cold hard cash and there are no fees that go along with it either! A great way to get better with using cash is to use an envelope system like Sinking Funds. I have a great printout in my Budget Bundle that helps you organize your cash and get specific about how much you need per month. If you just plain spent more in one area, get crafty and find places that you can move your money around in order to make more money in that part of your budget. Money is just an inanimate object after all. If you can move a pencil you can move some money around. Sometimes it just takes a little thinking. If the struggle is real and you’re not finding much money to move around, maybe you can make some money by cutting unnecessary spending. Bad habits like cigarettes, magazine subscriptions, cable bills or even the internet? There are always coffee shops my friend. Especially if you are responsible for providing for a family, sometimes it’s just plain necessary to get rid of the unnecessary. When Tom and I started taking Dave Ramsey’s Financial Peace University, there were so many great lessons to learn, but one of my favorites was the “drawing the line” theory that Dave and his wife lived by while digging themselves out of debt. This meant that they looked at their money and their bills and they made a list of the ones they could pay that month. All the other bills were going to have to wait. You may have to un-sweet talk some collectors, but if you don’t have the funds, you don’t have the funds. Good bills for this might be ones that aren’t charging you interest or late fees. Maybe you have some bills from your kid’s school, doctor’s bills or even charities that you may have to stop your giving to for a while. It’s ok to say “no.” In fact, it’s smart and healthy and could very well be your saving grace. Now that you know where you went wrong and you have a clear idea of what to do differently the next round make sure you write it out and get it on paper. Get some ideas on how you could get an extra $10,000 per year by changing a few things in your budget. This budgeting thing can definitely be an experiment. You may have to keep tweaking until you get it right. That’s why I recommend writing everything out. Saying it out loud and then writing it down will help program your brain to actually make it happen. Keep in mind that this might mean selling some stuff. If so, Decluttr is a great online source to use to get the most for your stuff with as little effort on your part as possible. If you are in a deep hole, it’s time to get serious about digging yourself out. It might be time to look at getting yourself a part time job just to try to get caught up if you are falling behind. Start a blog – Starting a blog has allowed me to have something separate from motherhood, something that allows me a creative outlet as well as flexible income. Photography – If you have a passion for photography, it’s very easy to start offering to do photos for friends to make some extra cash. Etsy shops – If you are crafty and creative, use your talents and skills and share them with the world by opening a shop with Etsy! Tutor – Check online companies like VIPKid, QKids and SayABC and allow yourself a flexible, work at home way to make money on your schedule. Virtual assistant – Being a virtual assistant is becoming more and more common these days as more and more business is done online. Get together your skill set (typing, graphic design, marketing, social media) and start spreading the word about you! Transcription – This is what my mother did as a work from home job all my life. Sometimes she was in an office and sometimes she was at home. Now transcribing is more and more common for people to do from home and can actually pay significant amounts of money! Get more info. Freelance writer – More and more websites and online publications are willing to pay cash for your articles and input! It’s a great way to use your writing skills and make some extra cash! Get started. Resell – More and more people are learning the ins and outs of discount shopping and re-selling online with eBay or Amazon. Get the Why Selling on Amazon Works FREE eBook! Drive for Uber – Drive anytime, 24/7. It’s flexible and works with your schedule. Drive for Uber Eats – Try delivering food with Uber Eats. You’ll bring the local food people love right to their door. The money you earn gets paid out instantly with Instant Pay, and it’s super flexible –you can deliver day or night, for however long you’d like. You just turn on the app, and you can start receiving delivery requests in your area. Whatever the case, all you can do is work through it. Dave Ramsey started FPU in debt and filing for bankruptcy. I bet he had no idea that one of the hardest times in his life would end up making him tons of money and helping others to avoid his same fate! When it comes to budgeting, don’t stress it. Just do what you can where you can and let go where you have to and just keep on treading that water. You’ll get where you’re going! Same here Deni! I’m so thankful we made the switch! These are all really helpful tips! Thanks for sharing! Absolutely! Glad you enjoyed Melanie! All very good tips – especially the one about not being able to pay every bill, every month. I think the idea of focusing on what’s MOST important is a good one. And using cash is usually a good way to spend less! Right? I feel like Dave Ramsey telling me it’s ok if I can’t do it all was extremely helpful! You are right that sometimes you just need to go to cash until things get sorted out. Credit cards are way too easy to get into trouble with! Oh yes. I know that all too well! Great tips, I haven’t set down with our budget in a little while and it probably time for me to do that. I have re-done ours like 4 times this month!! haha As we prep to finish tackling our debt I keep thinking of new ways to move money around! How many people think about when the budget going wrong? We created a budget lesson in our email financial mess series and budget going wrong hadn’t donned on us. -Doing a compare and contrast is smart. Time consuming but will show where the inconsistency and overspending went. -The bills are never forgotten just ignored, lol. Though seriously a few automatic bills fall through the cracks going un noticed. Can we use this as a resource in our financial series? I would be happy to have you share. Please be sure to link back to my page. Thank you very much for your positive thoughts! Great tips. I’ve been an Ibotta user for a few years now, and love it. A couple other money-back apps are Checkout 51 and SavingStar. Yes! I’ve heard of those as well! I suppose the more the merrier! It took me a good couple of years to get my budget to work. I kept getting unexpected things crop up. And I forget about several once a year payments. I Now have a life fund which helps when things come up unexpectedly that I want to say Yes to and a fund that I pay into all year to cover once a year payments. This pretty much means my budget stays roughly the same month by month. That is awesome! I’m glad I’m not the only one! Great tips!! I am all about budgeting and using the cash envelope system. I need to review my spending, even within my budget, more often. I have had fun doing that this month. Really trying to finish off our debts has made me evaluate and re-evaluate everything…and then again. I love that you mention “just keep swimming”, hah I love it. I definitely need to start a budget now. My mom lost my dad 2 weeks ago so I’ve moved in to help her, but her (their) bills & my bills still have to be paid. This advice came a long at a hard time and I thank you for the clairity. It’s all you can do. I’m so sorry to hear about your loss. I lost my dad when I was 19 and since he wasn’t married I was left trying to figure out so many thing I just didn’t even comprehend. I’m glad the post could have been of some help during such a trying time. Much love to both of you. This is super helpful! We canceled cable, the best thing we did! The area we spend the most is food for sure, it doesn’t help that my husband and I are both chefs. Yes, food is a tough one! Probably our biggest struggle! And I couldn’t agree more about doing away with cable! Who needs it!? Thanks for this thorough post! I love your tip to only use cash; I think I need to start implementing that strategy. For some reason, I am much more frugal when I have to pay with cash. Plus, if I don’t have enough money, I simply can’t buy it! Exactly! It’s a very HANDS ON approach. It definitely works best for us to do it with cash as well.